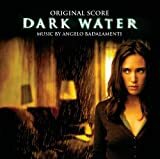 Accueil Produits Bande originale La bande originale de “Dark water”. La bande originale de “Dark water”. Compositeur : Angelo Badalamenti et Philip Marshall. The Tram (Main Title) – 2:13. The Drip Stain – 3:23. Deluge in 10F – 3:12. Mom from Hell – 2:25. A Ghost in the Machine – 3:58. Hello Again Kitty – 1:47. The Water Tower – 2:37.